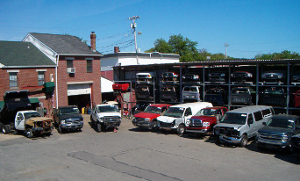 We are not responsible for any labor costs including downtime and towing for the installation or removal of parts sold. Cores must be returned complete and assembled as picked up with all parts. Engines have heat tabs installed on them. If the center of the heat tab is melted out or the heat tab is removed, the guarantee is void. Used parts carry a specific guarantee that ranges from 30-90 days, front of invoice will state actual guarantee / we do not guarantee parts misdiagnosed. Automatic overdrive transmission must be installed by a professional installer. (A) codes to be checked (B) shift cable adjustments to insure transmission is properly operating (C) flush lines and cooler. Returns must be handled by original salesperson, accompanied by sales receipt. Cylinder heads are guaranteed against cracks only. All used parts carry an identifying mark of SCHOOL STREET TRUCK PARTS. We do not guarantee parts used for the alteration or modification/conversion of a vehicle. Re-build parts will carry a specific guarantee that ranges from 90 days to 1 year depending on part. If the part being purchased is rebuild, the front of the invoice will state the guarantee of the part. $ 20.00 fee on all returned checks.